^ Sauval 1724, p. 9: "dans un vieux Glossaire Latin-Saxon, Leouar y est traduit Castellum". ^ Briggs 2008, p. 116. ^ Figure from Berty 1868, after p. 128 (at Gallica), with modifications based on a figure from Hautecoeur 1940, p. 2. ^ a b Ayers 2004, p. 32. ^ a b Ayers 2004, pp. 32–33. ^ a b c d e Ayers 2004, p. 33. ^ Hanser 2006, p. 115. ^ a b Ballon 1991, p. 15. ^ Hanser 2006, p. 115; Ayers 2004, p. 33. ^ a b Mignot 1999, pp. 34, 35. ^ Sturdy 1995, p. 42. ^ a b Blunt 1999, p. 47. ^ a b Ayers 2004, p. 34. ^ Drawing by architect Henri Legrand (1868) based on historical documents reproduced in Berty 1868, after p. 168 (at Gallica). ^ Figure from Berty 1868, after p. 56 (at Gallica); discussed and reproduced in Lowry 1956, pp. 61–62 (c. 1560, date of completion of the Pavillon du Roi; Lescot wing completed in 1553); Fig. 20, discussed on p. 143. ^ a b c Mignot 1999, p. 39. ^ Ayers 2004, p. 35. ^ a b c d e Ayers 2004, p. 36. ^ Edwards 1893, p. 198. ^ Berger 1999, pp. 83–86. ^ Ayers 2004, p. 37. ^ Héron de Villefosse, René, Histoire de Paris, Bernard Grasset, 1959. ^ Biasini et al 1989, pp. 152–153; Ochterbeck 2009, pp. 174–201; Louvre: Interactive Floor Plans; Louvre: Atlas database of exhibits. Bautier, Genevieve Bresc (1995). The Louvre: An Architectural History. New York: The Vendome Press. ISBN 9780865659636. Berger, Robert W. (1999). Public Access to Art in Paris: A Documentary History from the Middle Ages to 1800. University Park: Pennsylvania State University Press. ISBN 9780271017495. Berty, Adolphe (1868). Topographie historique du vieux Paris. Région du Louvre et des Tuileries. Tome 2. Paris: Imprimerie Impériale. Copy at Gallica. Biasini, Émile; Lebrat, Jean; Bezombes, Dominique; Vincent, Jean-Michel (1989). The Grand Louvre: A Museum Transfigured 1981–1993. Paris: Electa Moniteur. ISBN 9782866530662. Blunt, Anthony; Beresford, Richard (1999). Art and architecture in France, 1500-1700. New Haven: Yale University Press. ISBN 0-300-07748-3. Briggs, Keith (2008). 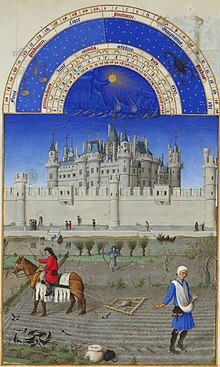 "The Domesday Book castle LVVRE". Journal of the English Place-Name Society, vol. 40, pp. 113–118. Retrieved 16 February 2013. Christ, Yvan (1949). Le Louvre et les Tuileries : Histoire architecturale d'un double palais. [Paris]: Éditions "Tel". OCLC 1122966. Edwards, Henry Sutherland (1893). Old and New Paris: Its History, Its People, and Its Places. Paris: Cassell. View at Google Books. Retrieved 30 April 2008. Hanser, David A. (2006). Architecture of France. Westport, Connecticut: Greenwood Press. ISBN 9780313319020. Hautecoeur, Louis (1940). Histoire du Louvre: Le Château – Le Palais – Le Musée, des origines à nos jours, 1200–1940, 2nd edition. Paris: Administration provisoire d'imprimerie. OCLC 433847563, 174906288. Mignot, Claude (1999). The Pocket Louvre: A Visitor's Guide to 500 Works. New York: Abbeville Press. ISBN 0789205785. Ochterbeck, Cynthia Clayton, editor (2009). The Green Guide Paris, pp. 168–201. Greenville, South Carolina: Michelin Maps and Guides. ISBN 9781906261375. Sauval, Henri (1724). Histoire et recherches des antiquités de la ville de Paris, vol. 2, Paris: C. Moette and J. Chardon. Copy at Google Books. Sturdy, David (1995). Science and social status: the members of the Académie des sciences 1666-1750. Woodbridge, Suffolk, U.K.: Boydell Press. ISBN 085115395X. Preview at Google Books.